Like most kids who grow up in this idyllic premier holiday destination, Matt had the need to travel to find out about the grass on the other side and how green it really is.This is an essential part of falling more and more deeply in love with “Plett”. Those who leave invariably find that they cannot wait to return and that their appreciation deepens every time they leave this magical part of the world. Like a beautiful woman, Plett’s beauty is intoxicating forever. Little did he know, as a boy in the pristine Plett Primary School, that the time would come when he would marry the pretty little girl sitting 3 desks away from him. He never spoke to Halszka while they were at Plett Primary and he never dreamt that years later he would meet her, on the other side of the ocean. His wildest imaginings could not have predicted that they would come ‘home’ together with the conscious decision to raise their kids in a place as closely aligned to paradise as possible, Plettenberg Bay. On his journeys, Matt discovered that, although the grass was delightfully green in London, the pot of gold was definitely at the end of the rainbow in his own backyard in the Garden Route of South Africa. Matt and his wife are conscious that ‘Where litter lies, beauty dies.’ They are leading lights in the inspirational Keep Plett Clean group of activists who are local heroes. A visit to Plett confirms the wonderful job they are doing to keep Plett as Pristine as possible. Maybe it is not your ‘thing’ to join a group and physically clean up your environment. After all, how we invest our time and money is a personal choice and it is our right to do whatever makes us happy. Most people find it makes them happy to contribute towards good causes. Maximise support for Matt. The distance the Legends cycle in the Cape Town Cycle Tour is about 100 km so what about challenging him with R2 or R10 per km? You decide. By supporting Matt you will be supporting Lunchbox Theatre who have a very special show called What a Waste. Read about how the staging of this show conveys the Clean Society message to our up and coming generation. With the proceeds from Matt’s sponsorship drive, we can stage another What a Waste Show and possibly even run an interesting and effective inter school litter eradication competition depending on how generous you guys are! 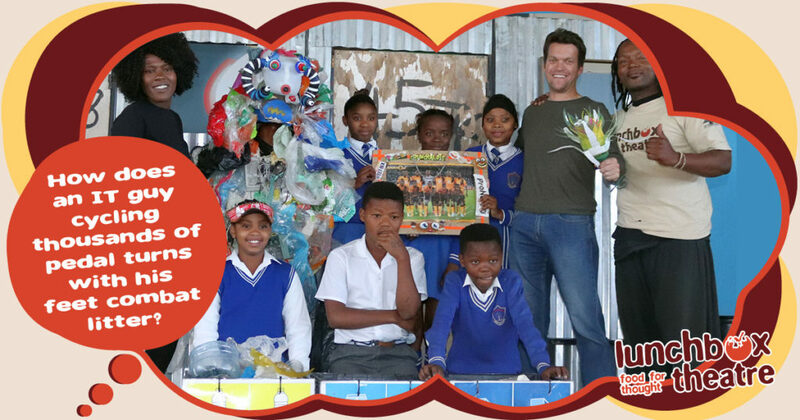 This entry was posted in Environment and tagged act, acting, Cape Town Cycle Tour, Cape Town Cycle Tour 2019, children, citizenship, comedy, concert enactment, Donations, donors, drama, eastern cape, ecology, education, environment, families, garden route, government, green waste management. Plettenberg Bay., kids, litter, Live theatre, performance, performing, play, public spirit, schools, show, social, social conscience, south Africa, sponsors, stage show, teachers, teenagers, Waste, youth.